This listing contains 82a Durometer Inline Wheels. 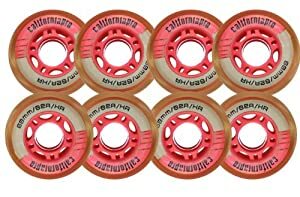 These wheels are perfect for outdoor skating, and utilize the standard size 608 bearing hub. The 82a Durometer rating provides a soft, smooth feel, with a decent life span. For that reason, 82a is the most popular outdoor durometer rating. If you are looking for a longer lasting wheel, check out wheels with a durometer rating of 83a or higher. Wheels with a harder durometer rating will feel less smooth but last longer. Listing Includes: Qty x8 Wheels, Measuring 68mm in Diameter, and 82A in Hardness.